Becoming a volunteer is a rewarding experience that will change your life in order to know the Ecuadorian culture, get in touch with social problems, contrasts and gives you the opportunity to help other people with less opportunities in life. 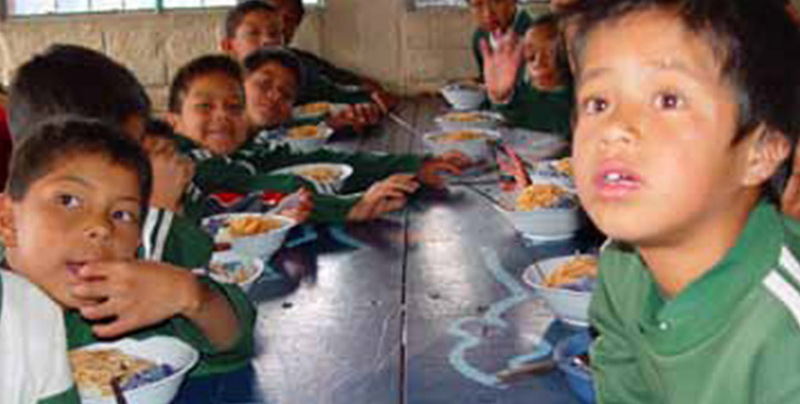 The school is proud to introduce you to Ecuador´s volunteer opportunities. 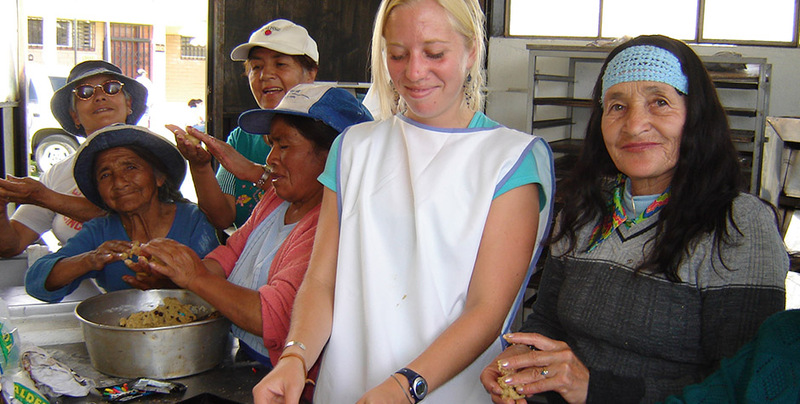 We offer programs of volunteer work abroad in social ,health and community areas. You can make an intern ship in the following areas: social work, research, nursing, medicine, geriatric facilities , physiotherapy, and psychology. The Foundation has and especial area for medical care and physiotherapy for the elderly people including all the machines, technology and supplies to assist the patients. The Foundation hires students of medicine, nursing and also students that are interested in assisting in the administrative areas filling out charts, handing out medicines, supplies, , and helping with the daily routine .Volunteers are kept very busy and are greatly valued! The intern will present at the end of the internship a summary of their job including all the skills they have developed , this paper will be evaluated in order to obtain a certificate. The Foundation is divided in different areas to keep elderly people active and busy the whole morning. The workshops are: bakery, literacy, chorus, dancing, painting, and theater, areas which volunteers are encouraged to help with. Human interaction is important as some of the elderly people sometimes feel isolated. - Help in preparing the menus for the elderly people. - Caring for the elderly people and offering them companionship. - Becoming part of a workshop and sharing the activities with the elderly people. - Organizing cultural and family activities and events. The Elderly Care program requires volunteers to work a minimum of 3 hours per day .Elderly people come to the Foundation Monday-Friday 8:30am-13:30pm. Interns and volunteers can have lunch daily for free will the elderly people and will obtain at the end of their work a certificate from the Foundation. 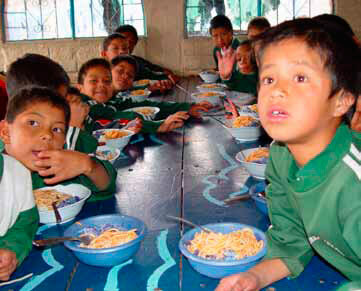 This program is support by REMAR Foundation in Quito . Located just 20 min walking distance to the Spanish School. Volunteers will assist in the Elementary School with the teachers, Gymnastics, groups integration. 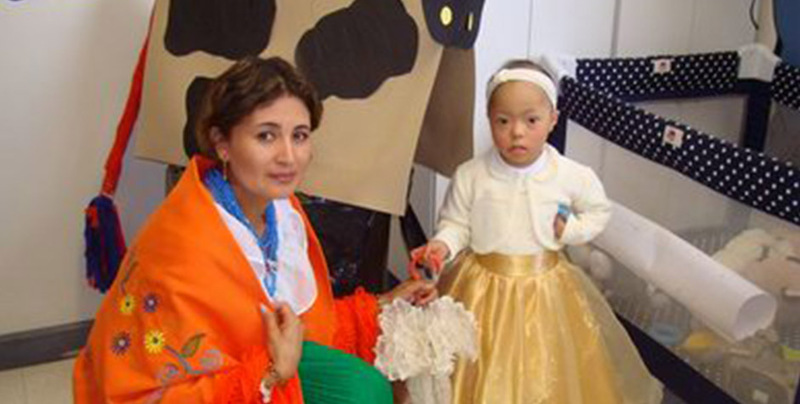 In the Nursery Center volunteer will be supporting in different worshops during the day. In the afternoons the volunteer will attend the Spanish School to take two hours daily lessons in order they can practice Spanish with their teachers and also improve their oral skills to feel more confident while they interact with kids in the volunteer program. 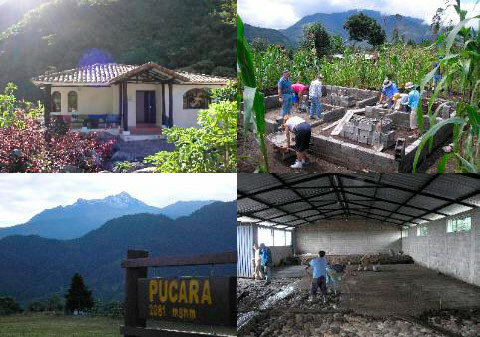 In this program the volunteers will visit Pucará Community . Pucará is a small agricultural village of 300 people at 2081 meters in the Intag River Valley, in Cotacachi County, Imbabura. The valley is located on the western slope of the Andes between Cotocachi and Los Bancos (3.5 HOURS AWAY FROM Quito) and is swathed in cloud forest and small farms. The Alto Chocó cloud forest of the valley is one of the world’s ten most bio-diverse ecosystems, and is deemed a Biodiversity “hot spot” by UNESCO. » The community is actively looking for individuals who have knowledge of, and can teach, the production of artesenal cheeses. » Volunteers and students are also needed to help the development of community tourism programs with input and analysis, and to participate in talks on the history of the Kayambi and future visions for alternativeland use and agricultural practices in the community of La Chimba. 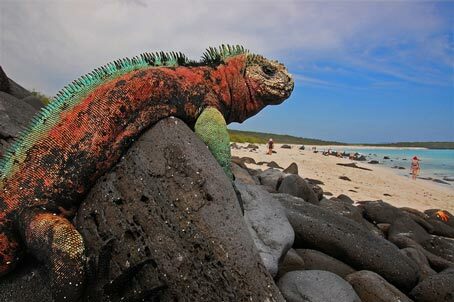 If you are interested in volunteering in Santa Cruz island in the Galapagos, learning some Spanish during your stay and exploring the Enchanted islands in your free time , this is a great package for you! 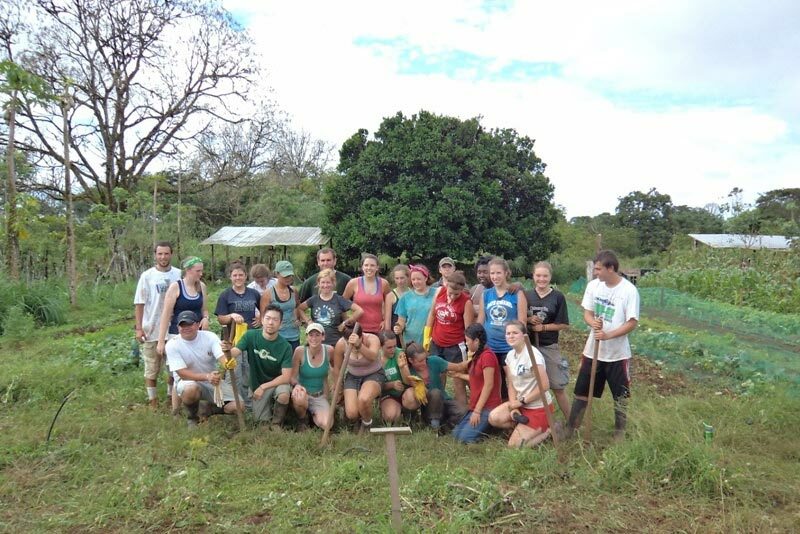 The volunteer program focuses on the national and international community that wishes to learn and enjoy the Galapagos Islands leaving a positive ecological footprint. 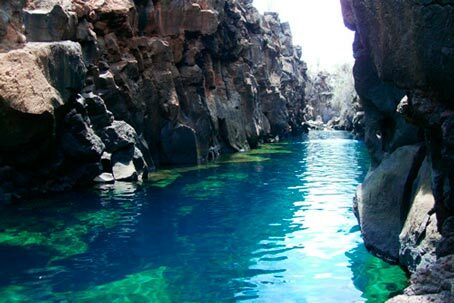 The program takes place in the Reserve Pajaro Brujo which is administered by FUNDAR Galapagos. 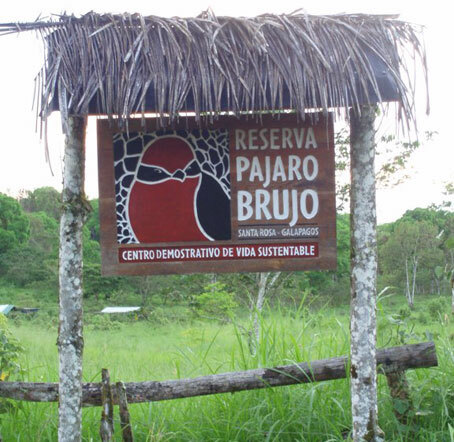 The Pajaro Brujo Reserve is located in the community of Santa Rosa, 20 minutes from Puerto Ayora (Santa Cruz Island). 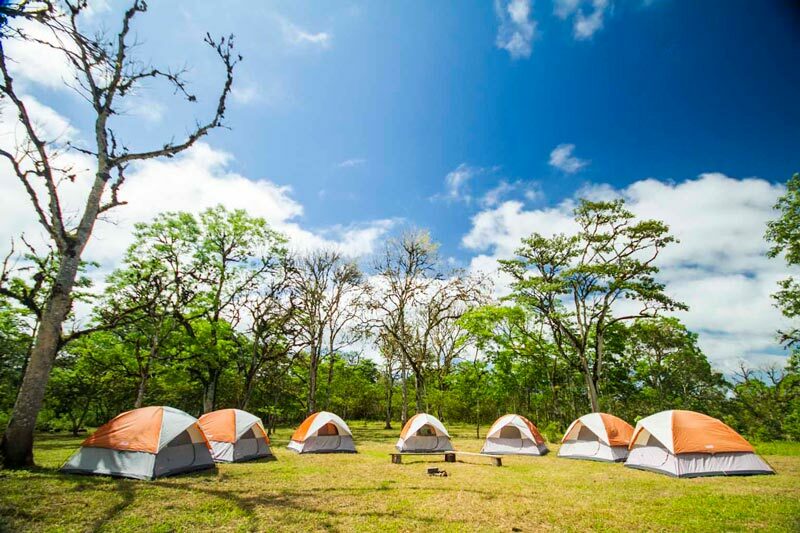 FUNDAR Galapagos runs educational projects aimed at changing the behavior of the population towards sustainability whether it is with development projects, strengthening the productive sectors of health or social research, as well as renewable and alternative energy. 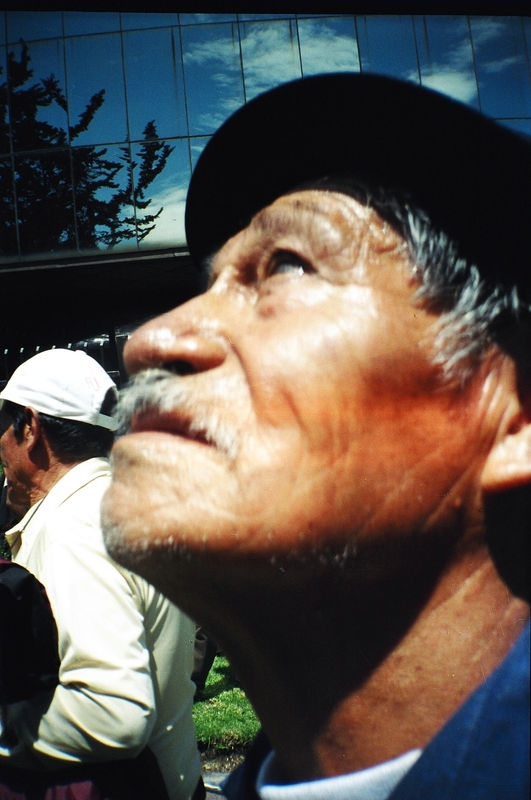 Vision: “Galapagos, a model of harmony between humans and nature”. 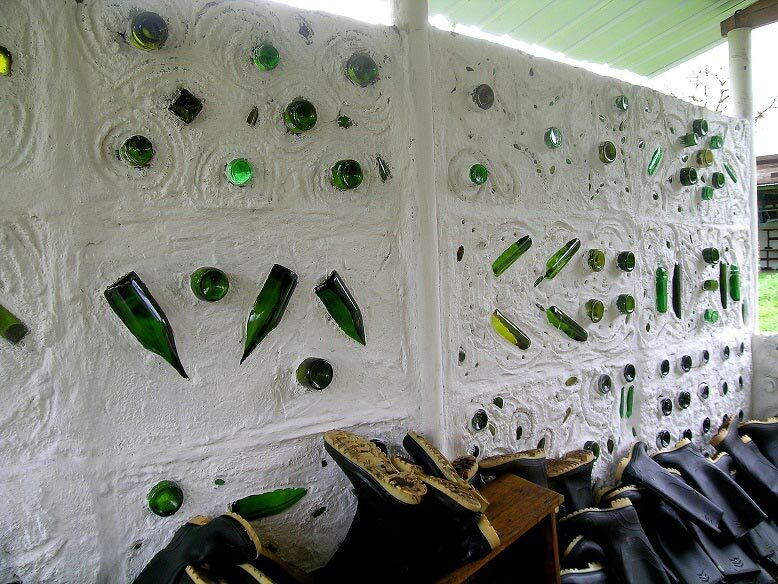 To leave a positive ecological footprint during the visit to Galapagos while visiting touristic attractions and contributing to the community and environment. Learning about reforestation techniques, taking care of plants and germination of endangered plants. Learning about sustainable living by practicing organic farming, methods of fertilization, control of insects in an organic manner and taking care of domestic animals. Learning about the importance of native and endemic flora and fauna from the Islands. Supporting the local community and people. Auditorium for workshops, SPANISH LESSONS ,seminars. The first day of your volunteer program you can choose with the coordinator the activities that are open for the volunteers for the coming weeks . 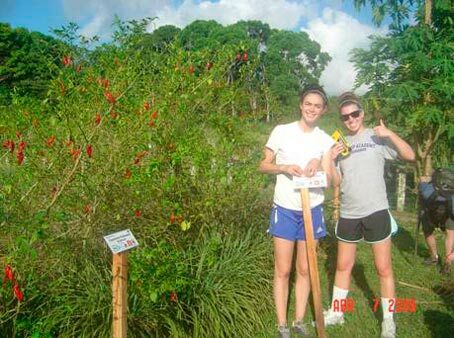 Volunteer activities vary depending on the season and priorities of the Reserve. Producing endemic plants called scalesia pedunculata in the nursery by germinating seeds, filling bags with soil, pouring water, insect control and general maintenance of the nursery. Planting the seedlings which were produced in the nursery in areas of ecological and touristic interest. Carrying the plants manually, digging holes and plant the seedlings. 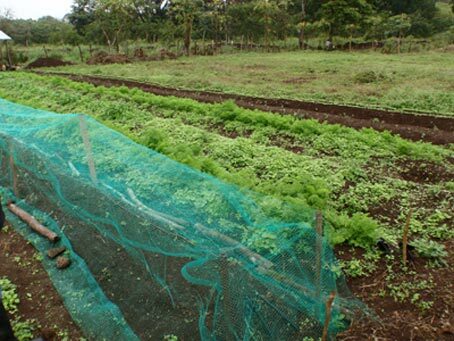 The reserve owns a organic garden where local people are encouraged to learn about organic farming. It’s necessary to maintain the garden by cleaning, planting, harvesting and germination of seeds without the use of chemical fertilizers. For the organic farm we need ecological fertilizers and insecticides which we produce on the farm with natural materials. 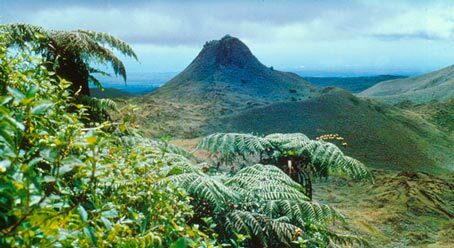 Introduced plants (which are not from Galapagos) are a risk for endemic plants because they occupy their space and habitat. It is necessary to control, cut and eliminate the roots of invasive plants. For organic farming we need domestic animals such as cows and chickens which have to be taken care of. Transfer out: Reserva Pajaro Brujo- Baltra. Santa Cruz- Quito flight morning flight. 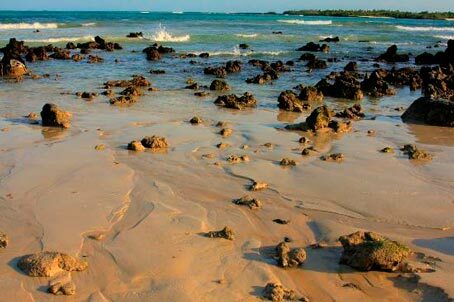 This white sandy beach, bathed in beautiful natural ponds of emerald green with thousands of colorful fish currency. The pleasant temperature of sea water and warm sand beaches invite families to spend leisure moments of comfort and long walks. Beautiful beach only five minutes from Puerto Ayora Port. A local water taxi will bring you there. 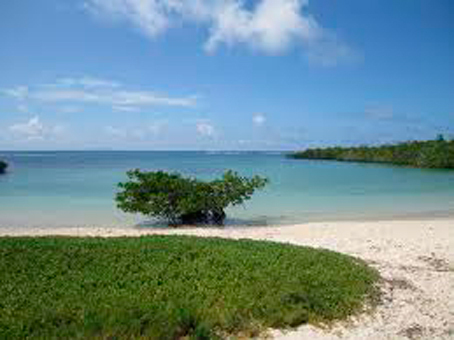 Is a beautiful unspoilt beach, 19 km northeast of Puerto Ayora where you can enjoy the turquoise water. In the Gravel you will find a pond, where you can see flamingos, black-necked pins. Is a place to swim in cool ocean water between two tall cliffs, where the earth has opened like a “crack” or “crevasse”. 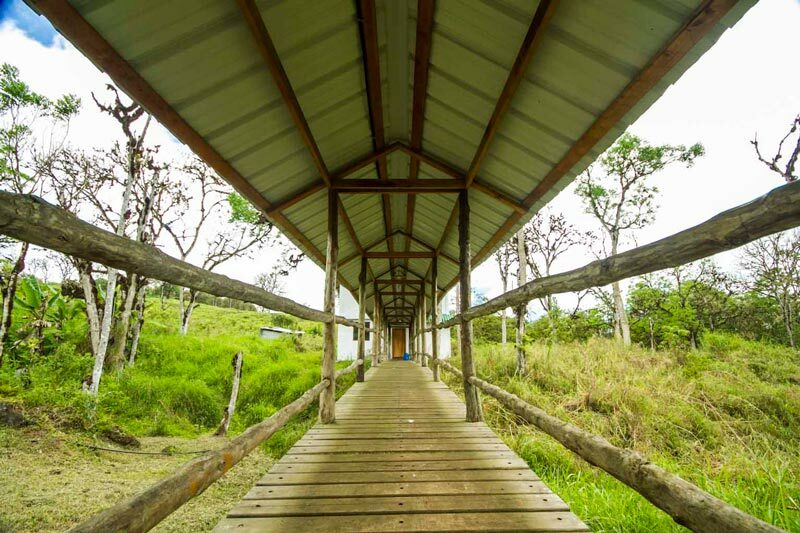 Upon arriving to the Grietas, you’ll find some wooden narrow steps that lead down to a jumble of large boulders. From here, you can climb carefully into the water. 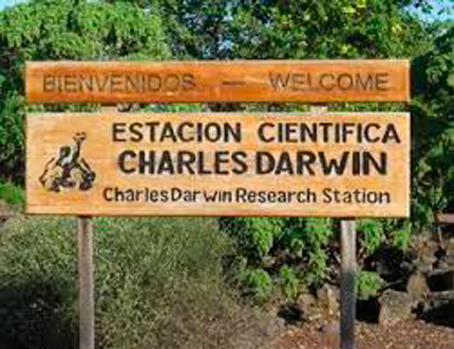 The Charles Darwin Research Station is in Puerto Ayora, where you can learn about the conservation efforts taking place in the islands and about the islands’ history, geology, and ecology. 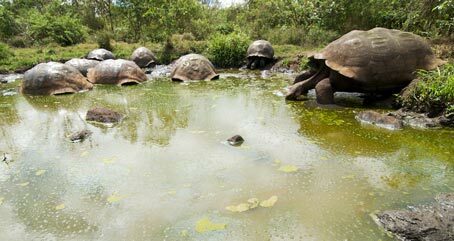 The ranch allows visitors to observe giant tortoises in the wild. These tortoises are distinguished by their domed shell and (despite their size) their short necks and legs. The latter is a result of the abundance of food on or near the ground, meaning they have not had to adapt in any way. Guests are free to wander about the ranch at their leisure, observing the giant tortoises eating, sleeping, mating and generally just hanging out. Is the highest point on Santa Cruz Island, (860m). It’s fairly easy to hike, and you’ll be rewarded at the top with a good view of Puerto Ayora. The terrain is leafy and green (and muddy when it rains, so bring good shoes). 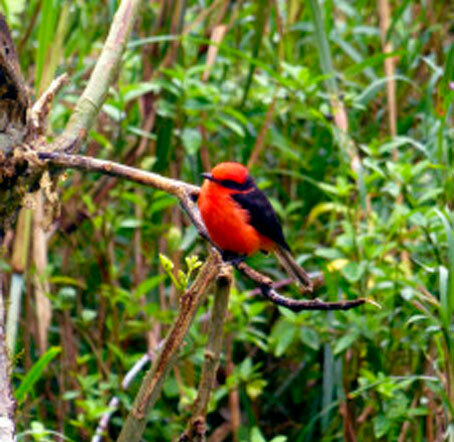 The Cerro Crocker hike is your best chance to see the elusive Galapagos Rail, a bluish purple-black bird that hangs out mostly on the ground. This is the largest Island on the Archipelago, and it’s made by five active volcanoes.Among the west side of the island we have Tagus Cove, right in front of Fernandina. 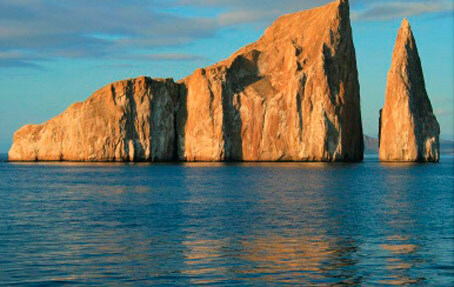 A boat excursion around the cliffs will let you see Galapagos penguins, flightless cormorants, pelicans and boobies. There are also good snorkel possibilities. In Bahia Urbina you will find flightless cormorants, pelicans, penguins, blue-footed boobies and marine and land iguanas, as well as Alcedo tortoises, if you get lucky. At the bay you will find rays and sea turtles. 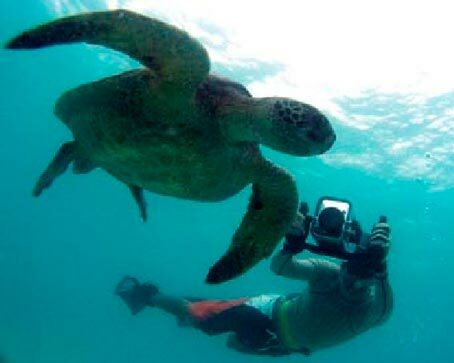 A little more to the south, at Elizabeth bay, you will be able to snorkel, and dive, you will also find rays and sea turtles, a dinghy ride on the hidden lagoons will give you the opportunity to observe dozens of sea turtles on a pristine and peaceful environment. To the southeast lies Punta Moreno, where one lands on an impressive lava flow. Walking on this flow will take you to several sunken brackish water ponds, with moor hens, pin tailed ducks, frigates, pelicans, and occasionally flamingoes and pied bill grebes. At the south easternmost point lies Puerto Villamil, which is surrounded by the largest and most beautiful brackish water lagoons, flanked by dense vegetation. The whalers of the 18th Century used to leave the mail in this island. In Punta Cormoran - one of its disembarkation ports- you can find a pretty lagoon inhabited by flamingos. Also a semi-submerged volcanic cone can be appreciated, it is named La Corona del Diablo, suitable site for diving. Its main attractive are birds like the albatross of the Galapagos. It is possible to observe small lizards and sea iguanas. You will also see the blue feet boobies and the masked boobies, Hood Mockingbirds also endemic to Española; swallow tailed gulls, oystercatchers, red-billed tropicbirds, but the most relevant attraction is doubtlessly the Waved Albatross Colony, a species also endemic to Española. Gardner Bay is one of the most beautiful white sand beaches in the Islands, with excellent opportunities of swimming and snorkeling around the nearby small, rocky islands. It’s the second most populated of the Galapagos. In the port Baquerizo Moreno you can visit the museum of the Franciscans and climb the Rock Leon Dormido, to obtain a complete panorama of the zone. 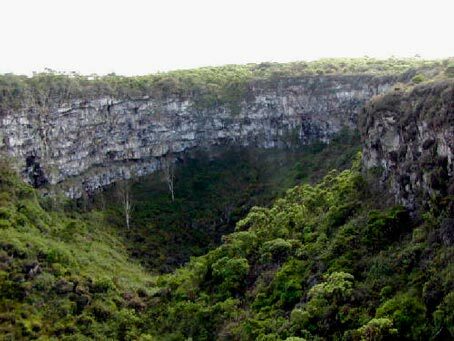 The Galapaguera, Cerro Brujo, Punta Pitt and Turtle Bay are places that can be visited and where you will find giant tortoises, flamingos and the 3 types of Galapagos boobies nesting together. All the offered options for tours in Santa Cruz and the rest or the islands are open to be done during the weekends. There are some sites that can be explored without guides , in other locations day tours can be booked directly in the Reserve. If the volunteers request previous information for the tours booking Terracentro is able to provide information. If the volunteers want the Spanish teacher to join the weekend activities they have to confirm that before they book the package and have to pay for his-her expenses. The program has to be booked with at least 3 weeks of advance before the arrival. Accommodation (Monday-Friday) in the Reserve . Three daily meals (Monday-Friday) in the Reserve. Volunteer guided activities in the Reserve (Monday-Friday). Transfers Baltra- Pajaro Brujo Reserve-Baltra. Flight tickets, Galapagos National park entrance. Day tours ,accommodation and meals for the weekends. If you would like to book a different package that is not offered in our website , we can personalize a program for you, the minimum of days for our itineraries are 15.